« Andy Lau a victim of sexual harassment. Sort of. This entry was posted on Sunday, November 25th, 2007 at 6:22 am	and is filed under Nicholas Tse, Twins, Meeting celebrities, Andy Lau, Humor. You can follow any responses to this entry through the RSS 2.0 feed. Both comments and pings are currently closed. it beats me too how janice managed to get herself in wax. andy lau, jackie chan, bruce lee… and janice. You know, for some reason, they did a REALLY good job with Wax Andy in terms of likeness. Jackie, the Twins, Cecilia, Nic and virtually every other wax figure I’ve seen bears a similarity to the celebrity it’s supposed to be made out to be like, but the Andy Lau figure looks uncannily like him than any other, even in pictures. But ya, you turned down a photo opportunity with Andy Lau? Wow, your modesty seemingly knows no bounds. you met andy and that’s all you had to say ? did you speak to him ? does he know about you or your website ? Who’s the wax-hugging babe? She’s more attractive than any new HK film starlet in the last 5 years. Wait, I’m not sure that’s a much of a compliment. 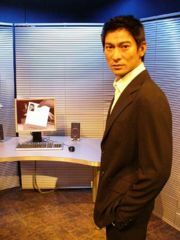 I didn’t actually meet Andy Lau…I just took a picture of him. I just decided at the time not to get a picture of myself with him because I saw All About Love and I knew it wouldn’t end well. About the wax-hugging girl, I’m not sure who she is. I saved those photos to my hard drive months ago, and I don’t remember where to get them now. I’ve always felt the wax figures don’t resemble their life forms all that great. Some do, most don’t. There’s always something that’s not perfect.